We want to suggest a better way to understand what the Cross achieved in relation to our human sinful condition. It achieved two things: first a death, and second a resurrection. If there is one thing the apostles clearly taught about Jesus’ death, it was that he did not die as a mere private individual, but rather for the sins of mankind. He died as a representative. While we evangelicals like to emphasise that our death was transferred to Jesus, the NT writers usually tell the story the other way round: we get to share in his death. His death implicates and involves us all. This one representative, who was made like us in every way, has taken sinful humanity (‘flesh’) upon himself. And then he, as the representative bit of our ‘flesh’, has taken it down to the grave . That forbearance had left sin active. It had left a question unresolved: was God ever really going to deal with sin – really perform the radical surgery needed to eradicate it? Would righteousness (justice) ever be restored and conquer? Or would sin and violence go on triumphing forever? Since Adam the question had never been settled, not even at the flood. Now at the Cross God finally goes to the root of the matter and finishes it off. He condemns sinful flesh and all its hostile divisions once and for ever in its representative, Jesus. Better than saying ‘he died the death we deserve’ is to say ‘we died with him’. Jesus in some way took our sinful humanity to the grave and left it buried there for good. “In accordance with the Scriptures”: this was what God had always said must happen to sin: it must die, along with those who embraced it. From the beginning he told Adam, ‘On the day you eat of it, you will surely die.’ When Adam embraced sin, God pronounced the only remedy: ‘to dust you shall return’. The flood drew a heavy line under this statement about sin: the only way forward for the creation was through the waters of death. The exodus told Israel much the same story: freedom from slavery and the new birth of the nation was only possible through the death of the Passover night – death both for the sons of Egypt and for the lambs of Israel, whose blood rescued the people. Israel remembered this sobering reality each year as they re-enacted the Passover and slaughtered the lamb again and again. Life came only through blood. If that wasn’t enough of an object lesson, God also gave Israel regular animal sacrifices as a perpetual reminder of the claims of sin: blood was called for to deal with and cleanse it. The only way to take away sin was through death. The scapegoats on the Day of Atonement spelled out God’s intention for dealing with the people’s sin: one was slaughtered, the other driven out of the camp into the wilderness. Exile and death are the way ahead for cleansing the people of their sin. Be silent before the Lord GOD! he has consecrated his guests. and I will punish the people. Here Israel’s exile is viewed as the sin offering. This is a frequent theme in the prophets: Israel’s wickedness cannot be removed by animal sacrifice: she must now bear her own sins in exile (cf Ezekiel 44:12, Hosea 10:2). This was why the priesthood and sacrifices were discontinued at the time of exile (Ezekiel 44:10-13): the nation must function as its own sin offering, its own blood must be poured out to put an end to sin. This is also sacrificial language: pouring out and burning up in fire. The nations are to become a great sacrifice that will put an end to sin. …he has doomed them, has handed them over for slaughter. …the mountains shall flow with their blood. The message is clear: sin can only be resolved by being put to death. Therefore death in exile is the fate of Israel, and of sinful mankind. and was handed over because of their sins. This talk of handing over (Gr. paradidomi) is the language of exile (cf. Lev. 26:25; Isaiah 36:15, 37:10; Jeremiah 34:20, 38:18; Ezekiel 25:4). Then in the gospel, Jesus comes and calls on people to take up their cross and lose their life with him. He insists that he himself must be ‘handed over’ to Gentiles and killed. Then he goes on his long march to Jerusalem, where he shuts down the temple and its sacrifices. He is actually handed over to the Gentiles, is humiliated and dies in disgrace outside the city. Jesus is playing the part of ‘the Servant’, living out the whole story of Israel in exile, becoming the sin-offering for the people. All four Gospel writers say that this is what was happening to Jesus: they hammer away at the exile-word paradidomi ceaselessly. It occurs 83 times in the Gospels, usually with reference to Jesus’ arrest and death. They allude to Isaiah’s Servant frequently (e.g. Matthew 8:16, 12:18ff; Mark 14:61; John 12:38; cf. also Acts 8:32-33). Jesus, they insist, is living the exile experience – and dying it. He has become the sacrifice to cleanse the sins of the people. When Paul writes that ‘Christ died for our sins according to the Scriptures,’ he is telling the same story as the prophets, but identifying Jesus as the servant who becomes the national sacrifice. When he says ‘He was handed over for our sins’, he is quoting Isaiah 53:12 (LXX). In this light Paul is saying that Jesus died as the sacrifice that finally put the people’s sin to death. But now he has appeared once for all at the consummation of the ages to put away sin by his sacrifice. The NT witness is tightly unified on this point, then. This is the first part of Jesus’ achievement at the Cross: he died the death we needed to die, he died it for us, and so somehow he destroyed our sinful ‘flesh’. Death is the only answer to our sin: not something to be escaped but something to be accomplished. For in the Bible story God’s justice is about him fixing his world, about restoring righteousness. He can’t do that without first destroying sin. Before the new house can be built, the old one must be condemned. There are many other images used to express this in the New Testament besides the ones we have canvassed. But they all point in this same direction. Evangelicals, failing to follow the story, habitually talk about death as what our sins deserve, as though God’s justice was mainly aimed at meting out just deserts to all. God must by all means balance the books! They miss the big picture of God’s purpose in justice. Redemption, not retribution, is the goal of the Bible’s story. The condemnation of sin comes in because it serves God’s central aim of renewal for the creation. This is why the atonement begins with Jesus’ sin-bearing death, but does not end there. In fact, all that we’ve described so far has been negative. We have seen what the Cross destroys. But this is merely the ground-clearing for the real work of atonement. Which is tomorrow. Yes, and that’s the hallmark of great theology! Does this way of describing the atonement avoid pitting the Father against the Son, as ST implies? Well, I would have thought so. In the story I’m telling, Father and Son are heading the same direction right through, no persuading the Father to be propitious. But what do you think, Matt? Maybe ST is too ingrained in my thinking, but God “carrying through” the sentence on Christ still sounds like a satisfaction. Do you mean by “condemnation” something like an indictment on sinful flesh, rather than Christ being treated like a guilty sinner? Thanks Matt, these are great comments. I can see what you mean. That paragraph speaks of the necessity of God’s wrath being carried out. Which ST does as well. So why are we still talking necessity? Why is it important for the condemnation to be enacted? AFter 1000 years of this ST distortion, our ST-filled minds run immediately down that track for an answer. But there are other tracks available. It’s all about categories. If you rephrase the question in medical terms, Why is it important to remove a cancer? Is it because the surgeon’s honour demands it? Maybe, but more likely you’d answer, it’s to save to patient. A different kind of necessity. Sometimes people react against ST by stopping talking about God’s wrath. I think that’s a category error. ST is only one way of understanding why God’s wrath is important. When the PC(USA) dropped In Christ Alone from their hymnal, because of the line ‘The wrath of God was satisfied’, they explained that it was not the wrath bit, but the satisfied bit that was problematic. They got it right. By ‘condemnation’ I mean God carrying out his sentence of death on all sin. Is Christ being ‘treated like a guilty sinner’? I try to avoid the word ‘guilty’, because I think it pushes us back to ST categories strongly. So I’m going with ‘sinful’. Yes Jesus is ‘treated like a sinner’ – specifically like sinful Israel. But importantly, he is actually part of Israel. He is treated like sinful flesh, for he has shared in our sinful flesh. He dies as our rep, because we all needed to die. I’m not sure if i’m scratching where you’re itching with that last bit. Hmm, I think I’m getting confused. So, it is still necessary for Jesus to die to fix sin, but NOT so he can satisfy the punishment but so that he can destroy the cause (sinful flesh)? Is that accurate? And, if so, why use the language of “condemnation”? We don’t “condemn” cancer, do we? What you are saying is probably true, I guess for me it doesn’t push back hard enough against ST conceptions of the atonement. Yes Matt that is what I’m hearing the apostles saying. Re ‘condemnation’, it’s an image, a metaphor. You’re right it isn’t used in a medical setting. 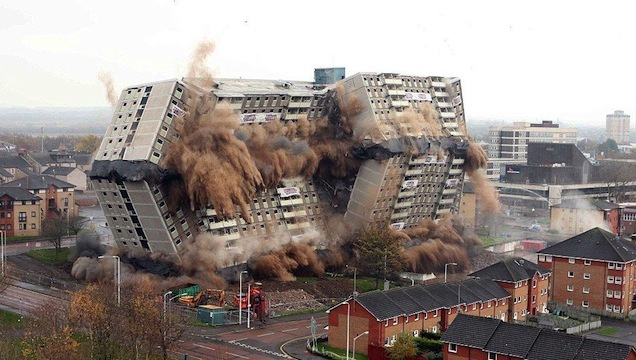 But , as the picture above suggests, it is used in building demolition! 2. I also wonder if you are (perhaps unintentionally) casting what Jesus has accomplished in more consistently impersonal terms than the Bible does. He doesn’t simply carry the sentence of death on sin, he carries OUR/MY sentence. He doesn’t simply bear God’s wrath against sin, but God’s wrath against OUR sin so that we might escape it. ‘having now been justified by His blood, we shall be saved from the wrath of God through Him. (Romans 5:9). 3. From an earlier post you state that your hermeneutical method here requires agreement with the metanarrative of the Bible. Why not just the Bible? What is the metanarrative? A summary of scripture? The narrative portions of scripture? An interpretation of scripture? If it’s anything other than the whole of scripture, don’t you give something other than the whole of scripture your final authority in the interpretive process? thanks for your great comments, Keith. they raise some big issues, perhaps I’ll break it down to answer. Re. 1. ‘Jesus death saves us but that it also achieves something necessary that relates to the character of God’ Romans 3:26. That’s absolutely right. But what sort of necessity? After 1000 years of Satisfaction Theory, it’s hard for us to imagine any other sort than the ST sort. We read Romans 3:26 and our minds immediately take that track as if there were no others available. I would suggest that this reading rips Paul’s words out of context and interpret them in the realm of medieval European thinking. If we plug Rom 3: 26 back into the passage, and the bigger story Paul is telling about Israel and the world, then we realise that he is totally immersed in the world of thought of the OT prophets. In particular he has raised the prophetic idea of God’s righteousness or justice (same word) – a term from the Psalms and Isaiah. There it relates to God establishing justice in the world, dealing with evil and vindicating his faithful people. In Isaiah, God’s righteous is used time and again as a synonym for ‘salvation’. The term ‘righteousness’ is used in this way over and over in these prophetic books. The story these prophets tell is the one we’ve outlined in this post: God’s character is called into question by the ongoing existence of sin amongst his people and in his world. Is he the judge who rescues his faithful and punishes evil? Will he fix things and establish righteousness – or not? And the answer the prophets give is, Yes. His righteousness is coming soon. This is the context Paul has established for his epistle by announcing upfront that his theme is the revealing or appearing of righteousness of God (Romans 1:17). God had left the question hanging, but now he has settled the matter: he has set forth Jesus as a place of atonement in his death and resurrection, to reveal or demonstrate his righteous – in the prophetic sense of that term. By giving Jesus as a sin offering, he puts an end to sin in the flesh. By raising him up into salvation, he vindicates his faithful servant. Both sides of justice are accomplished in Jesus. By enacting righteousness in this way, God answers the big question: is he the righteous judge? – yes he is. He is righteous – and the one who vindicates his servants who put their faith in him. This was the question that had to be answered. So, yes, necessity, but of a different kind from the ST variety. The fact that this is not our normal way of reading Romans 3 is simply the result of our failure to read it in its proper context – in the story of Israel, where Paul locates it. But as soon as you place it in the story the prophets tell, it reads pretty clearly. There is clearly something here that’s making you hear ‘impersonal’. Hence your point that it was our sin and our death. Strange thing is, that’s the same point I make all the way through the post. About 50 times. The whole question we’re answering is set up in personal terms: how did Christ help our human sinful condition? I’m sure there’s something in the post that you’re responding to. I wish I understood better what it is. This is a big big discussion. I won’t go into the details here. The overview is, that the metanarrative of the bible is what we sometimes call ‘salvation history’. That’s a way of saying that the arena in which God reveals himself is the time-space one of world history. The Bible faithfully reports that history to us, and reflects on it, responds to it, etc. But – and here’s the key thing – the history is bigger than the Bible. Although we find the history in the Bible as a narrative, that shouldn’t confuse us into thinking of salvation history as a subset of ‘Scripture’. Scripture is a subset of salvation history: it is the sanctified record of it. And in fact we find the apostles constantly doing their theology by reflecting on the story. They often reflect on the words of scripture, of course: but they constantly take their cues from the story itself. Hey Jonathan, I may well be misunderstanding what you’re saying but your article came across to me as saying that although Jesus deals with sin in his death, or Israel’s sin or his people’s sin, that he doesn’t actually pay for my/our sin in particular. He doesn’t actually bear God’s anger against my sin. If that’s the case I think it’s very hard to talk about Jesus death in personal terms, like ‘Jesus died for me.’ To be fair you do you use personal terms a number of times, but you seem to exclude individual interpretation of these personal terms and seem to default more to terms like ‘human sin, Israel’s sin, sin etc. when speaking of Jesus’ death. Hope that helps. Should I hear the emphasis here on the word ‘pay’? That’s not a term I’ve been using. It belongs much more comfortably in a Satisfaction Theory model. But it’s very hard to find this language in Scripture. Or are you leaning on the word ‘particular’? As in particular redemption. This idea of ‘he paid for my particular sin’ is the answer to the question ‘whose sin in particular did Jesus die for?’ Which is a question that arises out of the payment/ST model. Which I’m suggesting is problematic. When you say “It sounds like he doesn’t actually pay for our sin” – which ‘our’ do you mean? Is there some other ‘us’ that you have in mind besides God’s people or mankind? These are what I mean by ‘our’ in my post. Who is your ‘us’? All this leaves me with the uncomfortable feeling that we may not be talking about the same thing. I’m not especially focused on the word ‘pay’ (although I don’t think the concept is unbiblical) or on the doctrine of particular redemption (though I do hold to that). However I don’t really know how to explain my concerns much more clearly than I have, so I’ll probably just have to leave this part of the discussion for now.